Our moving day is almost upon us. 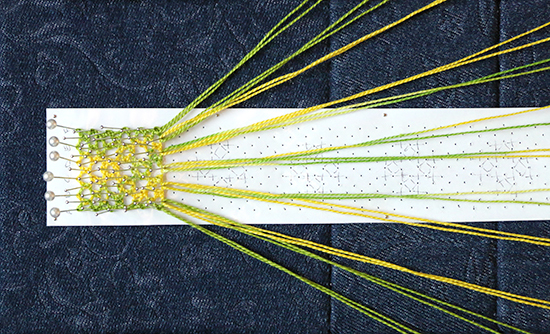 This spring, I wrote about discovering, and subsequently finishing, a forgotten bookmark project on my bobbin lace pillow. Once again, I found a partially finished project pinned down. Knowing that packing up the pillow would leave the bobbins a tangled mess, I felt compelled to finish this bookmark as well. The pattern is the same Half-Stitch Rose Ground bookmark, but this time I used brighter colors. For a smooth edge at the beginning of the bookmark, I wanted to work from the center point of the thread between two bobbins rather than knotting individual bobbins of thread together. I experimented with this once before and the result was successful despite the fact that I was told I guessed wrong on how to do it. This time I guessed differently. And this time I most definitely guessed wrong. When I took the pins out of the bookmark, the beginning edge was a series of loose loops. Running a single strand of one of the threads through the loops secured the edge to solve that dilemma. I need to look up the correct way to make a smooth beginning edge before I make my next bookmark. The greater dilemma is my apparent inability to master this basic stitch. You’ll notice in the above photo that the color pattern in the two “roses” on the left is very different from that of the three on the right. They should all be the same because the pairs of colors should be moving in a consistent pattern. I can’t see any glaring mistakes in the stitches, but I can feel a texture difference between the two sections. The left is bumpier than the right, which makes me think the problem is in the first section somewhere. On a positive note, that means that my most recent lace work was correct. I’ll revisit this pattern again sometime soon. 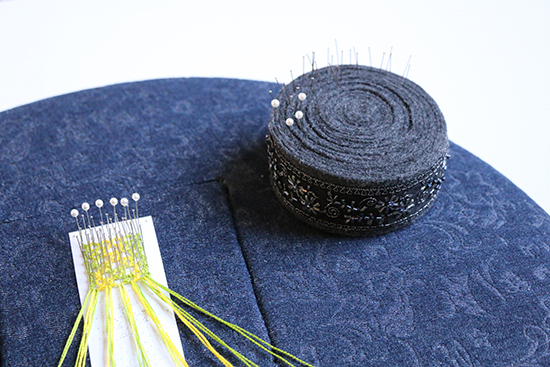 For now, I’m stepping away from the bobbin lace pillow. I don’t want any more difficult-to-pack projects sneaking up on me before we move. It's lovely, no matter the problem. I don't even understand how you do that! Good luck with your move and with trying this pattern again. To quote my young great grandson, "you can DO it!" Ditto, it is so pretty. I also no nothing about this type of work, except that I really like it. Thank you! I find it fascinating.